You want to learn the Fridrich but do you own a decent cube ? We are now going to have a look at the Fridrich method. This is the fastest and the easiest Rubik's cube solving method. 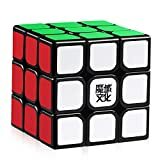 Most of the world fastest speedcubing athletes use the Fridrich method to solve the Rubik's cube. It is the key to solve the cube under 20 seconds or even 10 seconds if you really master the method. This method is named after its creator, Jessica Fridrich. She invented it at the end of the 1990s. She says she came with the idea of this method because it allows very fast inspection during the resolution. The corner firsts methods that were the best at the time did not allow such a fast vision. Here is a photo of Jessica while practicing on the Rubik's cube 3x3. The Fridrich method is only made up of 4 steps but also full of algorithm to learn. If we consider the first two layers as solved intuitively, there is in total 78 algorithms to learn to solve the last layer : 57 Orientation formulas and 21 Permutation formulas. Thankfully, you do not need to learn everything at once and each of these two steps can be separated in two sub-steps. The sub-steps are solving the edges and then the corners. This step 1 is the exact same of the step 1 of the beginners method. The basics are described in detail on our page which presents how to solve a Rubik's cube. But now, the cross needs to be solved fast. Every cross can be solved in under 10 moves. The whole cross solving should be planned during the 15 seconds of inspection, before starting the resolution. Once you are at that level, you should be able to solve every cross in under 1.5 seconds. To improve on the cross, my advice is to solve it blindfolded. During pre-inspection, take more than 15 seconds. Look at your Rubik's cube and try to see the optimal solution for solving the cross. At first you will only be capable of planning 2 edges, then 3 and then the whole cross. Once you can do any cross blindfolded, you will be able to focus on the first pair while solving the cross. This will make you save huge amounts of time. If you are interested in more information about solving the Rubik's cube blindfolded, have a look at our guide. I would also advice you to solve the cross on the bottom layer from the beginning. So flip the whole cube and start practicing with the cross on the bottom. It helps you to focus on unsolved faces, instead of focusing on the white face. It also avoids to flip the cube when the cross is finished, which will save time too. The aim is to perform the moves continuously and to have a good transition between each step. Every second you do not rotate any face can be saved. It just means that pre-inspection and/or inspection are not good enough and need to be improved. It is possible that solving the cross on the bottom wastes time in the beginning but it will quickly make you improve. If it is too difficult for you, maybe you can try it later on... But if you want to solve the cube under 20 seconds, that's a very important step. Although the cases can be very different, some similar pattern often happen. I am going to give you a few techniques to solve these cases. I found all these cases intuitively, just with practice. Memorizing them will save you time. One of the great technique is to put all the edges 1/4 turn of where they should be. After you're finished, just doing a D move (or D') will align the cross with the faces. When the cross is prepared a half turn to the solved position, it is particularly easy because all you need is to focus on opposite colors. Once finished, a D2 move aligns the cross. While doing the last D move, you can start inspecting for the next step of the resolution. These techniques are very helpful. It is now time to start practicing ! Do not under-estimate the progress you can make by just looking at the cube and trying to figure out the cross. Sometimes you can even take a minute to think on how to solve the cross. Simulating moves mentally will help you for the next solves and you will become more and more familiar with efficient cross solving. There is no general rule on the best way to solve the cross though. Everyone has his own technique and his way of solving the cross. It is up to you to find your own style and solution. A new speedcuber just appears ! The idea is very easy : Solve the first two layers at once. More precisely, every time you solve a corner, just associate the corresponding edge and solve both at the same time. This corner and edge are called a pair. Sometimes, it is easier to first build the pair and then insert it. Some other times, we build the pair and insert it at the same time. There are many websites presenting solving formulas for the first two layers. According to me, it is much more interesting to find all the cases by yourself. It is not complicated and you will remember them forever. To do this, I will still help you by showing you a few basic cases. From these 3 cases, you should be able to deduce the entire solve. They will be presented with an example. The basic idea of the first 2 layers is to pair the edge and the corner. And this needs to be done while inserting them at the correct place. On the following example, we can see that a simple rotation of the right face will pair the red white bleu corner and the red blue edge. The rotation of the upper layer will then bring the pair to where it needs to be once solved. Finally the R' move will complete the solve of the pair. Here are the two main ways for inserting a pair, when the white of the corner is not located on top. There is a third tricky case. This case occurs when the white corner has the white on top. This case will be solved in two steps. First we will turn the white corner so that it is not white on top anymore and then solve it with one of the formulas presented above. Every time you solve a pair, you are actually using the empty slot of that same pair. If you don't, you may break other pairs that have been already built before. Before letting you play with your Rubik's cube, I would still like to teach you a couple of tips. Most of the time, what slows you down is your inspection and your thinking. So there is no need of turning the faces as fast as possible. Take your time and try to anticipate. Secondly, try to minimize the number of times you flip the whole cube during the resolution. Flipping the cube is the time when no move can be performed. As everything changes when rotating the cube, all your inspection will be hard to transpose. It has to be maximum once per pair, ideally just once or twice during the whole solve of the F2L. You may be tempted to solve this case with your right hand. But doing it with your left hand will be quicker ! With a bit of practice, you left and right hands can solve cases equally as fast. Not turning the cube on this special case saves you about 2-3 seconds. Another important advice in the Fridrich method : If you are about to turn the cube, always make sure that you put the pair you are solving in the back. Why ? Because if everything that is solved is in the back, then it is much easier to find what to solve next. You would have a full visibility on all the unsolved pairs. Vision and thinking should be much faster too. With a bit of practice on all the cases, you should get closer to 10 seconds first two layers. That is a great first goal and will help you to solve the Rubik's cube under 20 seconds. Now you have everything to find the best F2L algorithms using Fridrich method. The algorithms you will find will make sense and therefore will be easy to learn and to perform fast. In the Fridrich method, the last layer is solved differently from the beginners method. It is the first step to the full Fridrich method, used by speedcubers. I will show you the orientation of the last layer in two steps. First, we will see how to orient the edges and then the corners. In a last step, we will see how to orient both at the same time. It is of course quicker but also requires to learn a lot of formulas. Fridrich method is also called CFOP. This stands for Cross, F2L, OLL, PLL. To know it fully there are about 80 algorithms to learn and that is why I am going to first introduce an intermediary method. Orienting the last layer means putting all the yellow stickers on top. To do that we will need to flip the corners and the edges. For the edges orientation, you should already know all the cases. I taught them in the page of the tips for solving the Rubik's cube. Nothing new on this step. Determining which case to use is very easy. You just need to count how many corners are not yellow on top. This should be immediate. But to correctly orient the corners, there are 7 different cases. Either 2, 3 or 4 corners are incorrectly oriented. The formulas can seem a bit long but they are quite easy to learn. They also can be performed very quickly. If you have 0 corner to orient then you can directly move on to the next step. Or the two corners are next to each other and the yellow is on the side. Or the two corners are next to each other and the yellows are not on the same side. In total, there are 57 OLLs. This is probably the hardest part of the Fridrich method. A lot of algorithms to learn. Some of them even happen less than 0.5% of the time. 1 chance out of 218 is actually the chance to have an OLL skip. The OLL skip is the position where all the last layer is already oriented without performing any algorithm. The learning can seem long and hard, but do not give up. Every algorithm will save you time. Even if you decide not to learn all of them at first, do it progressively. I would recommend you to start learning all of them only when you already know all the PLLs. The goal with this step of Fridrich method is to solve the cube. At first, we will do it in two steps : Solving the corners first and then the edges. To find the pattern on the corners, just focus on the side colors of the corners. If on one face the two corners have the same color, then they can be considered as solved and the other two will need to be permuted. Every PLL formula has a name based on a letter. This will be very useful if you want to communicate with other speedcubers about a specific algorithm. Every PLL can be performed in under a second by the best speedcubers. If you can not do that with your Rubik's cube, have a look at our guide to buy a Rubik's cube. Once you have located the two corners that are of the same color, the other two need to be permuted. You will need to perform the following algorithm : R U R' U' R' F R2 U' R' U' R U R' F'. This algorithm is called the T PLL. This means that corners need to be swap diagonally. To solve this, we are going to use the Y PLL, which is made up of the following : F R U' R' U' R U R' F' R U R' U' R' F R F'. Almost finished ! We just need to solve the remaining edges and the cube will be solved. Either one face is completely finished or none is. All the algorithms for this step are super easy and can be performed under a second. Of course, this will need a lot of practice. There are here two different cases. Either we want to swap the edges with the shape of a + (swap them with their opposite color). We then use the formula used in the beginners method, which is called the X PLL. The algorithm is : M2 U M2 U2 M2 U M2. Or we want to swap adjacent edges and we use the Z PLL : R U R' U R' U' R' U R U' R' U' R2 U R.
There are in total 21 PLLs which belong to the Fridrich method. This is a lot less algorithms than the OLLs. I would recommend you to start with these ones. Having a PLL skip has a chance out of 72 to happen. Congratulations ! You are now ready to be a speedcuber with your knowledge of the Fridrich method. You now know how to solve a Rubik's cube with the fastest existing method. So ... Easy peasy right ? Or do you feel like you need a better cube ? Looking for the best blindfolded Rubik's Cube solution ?